Summer Solstice dawned clear and bright. The poppies called and I could not resist. I have hundreds, maybe thousands, of photos of poppies but alas, I keep on taking more. Poppies are so fluid, so temporary, so delicate and so addicting. I just can not leave them alone. I decided to try out some film grain from Adobe Lightroom with the photo and I’m not sure which one I like best. Let me know what you think. 22 Jun	This entry was published on June 22, 2014 at 10:49. 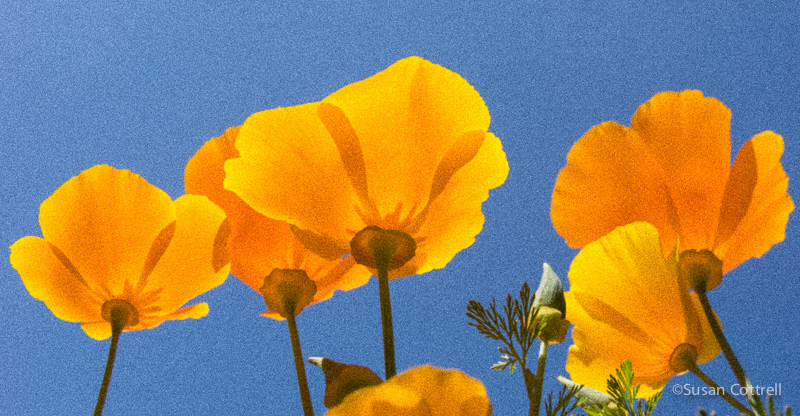 It’s filed under Flowers, Nature, Pacific Northwest, Sky and clouds, Whatcom County and tagged Adobe Lightroom, California Poppy, eschscholzia californica, film grain, inspiration, natural history, nature, orange, poppies, poppy, summer, Summer Solstice, wildflower. Bookmark the permalink. Follow any comments here with the RSS feed for this post. Absolutely beautiful. I prefer the first one — the flowers are translucent, and almost look like a watercolor. Lovely! I like the first one without the film grain. Aunt Susan, We want to buy a very large poster of this photo, the first one. Please tell me how to do so. It’s awesome. Thanks Matt! I love this one too. I have a photography website at http://www.7cphotography.com and it is in the flowers gallery.